Anna is 1 Month Old! 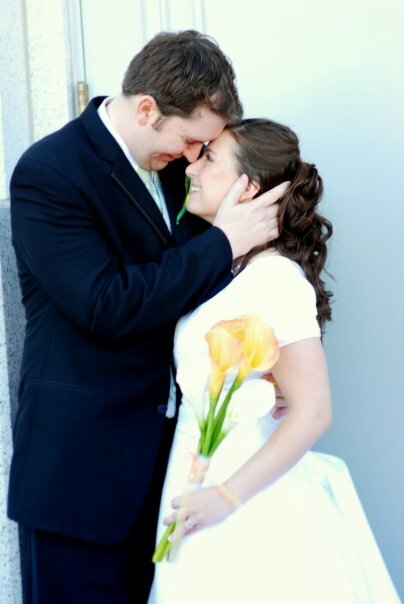 Four years ago I married my best friend of all time. In four years I've gained a husband, a partner, the greatest love I've ever known, having that love amplified which I never thought was possible, most recently a beautiful daughter who looks like her daddy. Now that we have our loveable, yet time and energy consuming munchkin, I'm even more appreciative of the years we had to ourselves. However, with our little addition I also have been able to see my husband become a father and a doting one at that. I've seen Ty with our nieces and nephews before so I'm not unaware of how good he is with children, but there's something different about it being our child that makes my heart skip a few beats to see him love her. On top of that he is a wonderful helpmeet. With my recovery taking it's sweet time, combined with low milk supply, I've had to lean on him for extra support to take Anna when I need to "make milk" for her or actually do something about the state of our house. I can't forget to mention the support I received from him while I was in labor. He certainly rose to the occasion. I lead an incredibly blessed life and a lot of that is due to Ty. The last four years seemed to have flown by, but at the same time it seems like forever ago. We were almost different people then and have grown together since. Better, stronger and more in love. I hope my daughter (and any more who decide to join our family in the future) someday finds a husband as wonderful as her daddy. I love him so much. He saves me every day from unhappiness. I lean on him so much for strength and he so willingly gives it. He's my favorite. Ty, I love you and am so grateful you chose me to be your wife. That you let me be quirky and weird and strange and love me for it (or despite it, whichever you prefer). Thank you for always giving me what I need and being my best friend. I can't believe I'm a mother to a one month old. I can't believe I'm a parent! It's impossible for me to not look back on the last four years and think about how much we longed for a child and suffered with infertility and a miscarriage only to end up having to learn patience and come to this point. It makes me reminiscent of this post from almost two years ago. Look where we are now. We have a daughter. A little person. We are no longer simply a marriage. We're a three person household. With the addage of our daughter, the house has certainly increased in activity. I'm either feeding, pumping, calming, or holding Anna. If I'm able to find even 30 minutes where I'm not taken over by baby duties, I make attempts at cleaning and cooking. Thankfully, I still have freezer meals that have been keeping me sane. I honestly don't know how I'd even get to a point where I could put together a full meal. What am I going to do when they are all gone? I suppose we'll have to survive on PB&J. Ty won't mind. :) Speaking of whom, Ty has been amazing and I'm so thankful he works from home and is willing to help me during the day. It's been a great blessing. When I need to "make milk" for baby, he's able to watch her, unless he has a meeting. He's such a great daddy. Seeing him with Anna melts my heart into a puddle of goo. It's incredibly precious. At her one week appointment she had lost 13 oz. since her birth, where she weighed 8lbs. 15oz. This worried me a bit considering how much that was in such a short period of time, but because it was just outside of the range of concern Ginger said it was fine. Now that we have a better understanding of how much she was getting from breastfeeding and have made the switch to supplementing with formula, she's made up for her lost weight. At her three week appointment she weighed 8 lbs. 9.5 oz. Since Ginger is out of town this week, but still wanting to see how much she's gained, I decided to weigh her with me on my .1 lb. increment scale. The difference was 9.5 lbs.! That's some pretty amazing progress. It's absolutely evident by her increasing chubbiness and ever-growing appetite. It makes me very happy and proud. - She can sleep up to 6 to 7 hours at night. This is quite nice, but I'm still up during the night because I try to pump at least once or twice. Then, just making sure she's okay keeps me awake. - Her cuteness is constant. I can't get over her and her little movements. - When she stretches, she does this "Superman" move where she straightens one hand forward like she's about to take off. Adorable. - The cooing. Oh the cooing. I die every time. - Her fake smiles. I know they aren't legitimate yet, but they give me the happies regardless and I can't stop smiling after she rewards me with one. - I'm convinced that she is a Physical Touch love language. She is calmed and falls asleep easily when she is touching skin. It's very sweet and I hope this means that she will be a great cuddle buddy. - I, especially, HATE baby acne. It just makes me sad. Particularly because there really isn't anything you can do about it. I can't wait for it to go away. - Open air leaks. Ty has had these encounters most often, however, I've definitely experienced my fair share. Many outfits had to be changed due to them getting peed on. Along with this, blowout diapers....not awesome. - Baby cries are cute. Baby screams are horrible. It never fails that if she sends herself into a screaming fit, my eyes well up with tears and we are both unhappy. We don't experience this very often now that we know how much she's eating, but from time to time when she's decided she's still hungry past what she has already eaten, it happens. This month went by so fast (and at times not fast enough), and I can't wait for her to be blessed soon. It will be so great for so many of our family members to meet her and swoon over her adoring cuteness. We do on a daily basis, so it's only right that we let others share in our exceeding happiness. When I delivered my little bundle of joy, I sustained some tearing of skin and a small amount of muscle. Immediately following the delivery I was pretty swollen in that area. All of this provided for an interesting recovery. I took Arnica tablets for the swelling and Ibuprofen for the pain. I spent the first week resigned to my bed, other than my trips to the bathroom, which were quite unpleasant. My midwife's assistant made up some Comfrey tea, which was mixed in equal parts with water and used with my Peri bottle. Standing was awful and I didn't for the first day (I crawled to the bathroom and back). When I finally did stand, all of the organs and innards that had been shoved up by my growing baby and her placenta, slowly made their way down and that was certainly uncomfortable and cause me to have shortness of breath. Not to mention the strain it put "down there". I would walk around a bit for as long as I could last and then get back into bed. For the first week the only nurturing I was able to give to my little daughter was breastfeeding and occasionally, I would even just hold her for holding her sake. It was slightly depressing, but I knew that there wasn't anything I could do since I needed to make sure I was healing properly. Luckily, I have an amazing support team. Ty took off a week from work and did a wonderful job with her and I loved seeing him interact with Anna. The co-sleeper was put on his side of the bed and he sacrificed sleep to make sure she was okay and woke me when she needed to eat. My mom spent two weeks with us while I recuperated and she was amazing to have around. Holding Anna when needed (or even not, she loves this baby :) ), fixing meals, cleaning, doing laundry. She even sacrificed a few nights to watch our little girl so we (mostly Ty) could get some sleep. The other struggle I've had to deal with is breastfeeding. I'm a strong advocate that breast milk is the best thing for babies. So when I had to make the decision to let my baby have formula because she wasn't getting enough from me, I felt defeated. I didn't even really realize that she wasn't getting enough from me until about a week ago. All I understood from her cries was that she was still hungry after nursing for an hour or more. My wonderful sister-in-law Celia let us have some of her frozen milk until my milk came in at first. This came in handy almost immediately. When Anna would scream for more food, we were left bewildered and relented into giving her formula and were grateful for Celia's milk to supplement with when needed. The day after my mom went home, I had a two hour nursing session with Anna latching off and on. I was frustrated with her, frustrated with myself, and all I could do was cry. I no longer had my mom there and Ty was now back to work so I was on my own taking care of our baby. I felt like nothing I did for my little girl was good enough. Breastfeeding no longer seemed as appealing as it had before and I couldn't wait until it was over. The next day was Saturday and we could see that we were almost out of Celia's milk. She offered us an open invitation to have more when we needed for as long as she could afford. Bless her heart. I will forever love her for helping us feed our Anna and I'm so grateful to have her as a sister. Ty asked me if we needed to get more and I said yes, but that if he was going, I was going with him because I didn't want to be left alone for that long since I was still recovering. So Sunday afternoon we headed to Othello and I was actually glad for the chance to get out of the house. Other than our short trip to see Ginger for our 1 week appointment, I hadn't been out of the house, or even really seen outside, let alone make an hour long drive. Not too long after we arrived, it was time for me to feed Anna. This provided Ty's parents, as well as Nathan and Celia, an opportunity to see our struggle to keep her happily fed. My mother-in-law, Cheryl, and Celia could sense my frustration and unhappiness and talked to me letting me know I was a good mother and that I was making good decisions for Anna. I sobbed finally letting out my emotions that I had been bottling. After some muscle testing from Rex, I felt better, though still frustrated with my situation. Celia let me try her electric breast pump, but it didn't seem to work for me. I had brought the hand pump we had purchased and I was able to get 2.5 oz. pumped after several hours since feeding Anna. Turns out the silicone massage cushion with petals is what makes the difference for me. This confirmed that I had a low milk supply and was why she wasn't getting full after nursing for so long. So, our chosen course has been this: I pump every 2.5 hours, Anna eats a little more than every 2 hours getting whatever I've pumped, supplemented with formula and/or Celia's milk while we can. We brought the issue up with my midwife and she gave me homeopathic drops to take twice a day to increase my supply. I think they have been helping as I used to get only an ounce every 2 - 2.5 hours and I'm now up to 1.5 or a little more. When I can remember I'm also drinking Mother's Milk tea and want to try a recipe for Lactation Boosting Cookies. I will never turn down a recipe for cookies and if these can help me boost my milk supply then we are in business. I'm still hoping to come back to breastfeeding. I know it will prove to be difficult now that she's been using a bottle, but I have a plan of action for that as well so we'll see how it goes. For now, I'm happy that my daughter is now well fed and almost back up to (if not already) her birth weight and is happy. That's all a mother can ask for. I was pretty sneaky posting those two pregnancy posts when I did. :) What can I say? Chronological order is important to me. Now that everything has happened, and I've finally been able to get on my computer, it's definitely time to document and share what I experienced and went through. The word surreal has been used by both Ty and myself, several times, to describe it all. I still feel as though I just woke up and all of a sudden there's a beautiful child in my responsibility. February 11th was my Estimated Due Date and when it came and went without any sign of labor I'll admit I was a little sad. At the beginning of the week I had felt and predicted she would come that week. However, we were very prepared for the unexpected. During my 40 week appointment, I had a cervical exam and found that I was 3cm dilated and 80-90% effaced. I knew all that uncomfortableness I had been "enjoying" wasn't just typical pregnancy discomfort. We went home and I texted two of my sisters-in-law and my mom and all three were sure this baby would be coming very soon. This had me excited, but I still didn't want to keep my hopes up for the possibility that things could still move slowly. At my 3 AM potty break, I lost my bloody show, but still knew that things could still take awhile to progress so I didn't get myself worked up. This being Valentine's Day I really wasn't keen on having my baby born on a holiday, though everyone else seemed to think it a cute idea. I'm really not sure that Valentine's Day would be that big of a deal, but I just wanted to avoid it if I could. Fortunately for me, I went throughout the day without much happening. Ty and I went to Safeway before dinner to gather a few things and luckily it was a fairly short visit, but it felt like hours. My feet hurt, my legs hurt and I simply felt like standing was a burden. I couldn't wait to get back into the car so I could sit down. We got back home and had our dinner and spent the rest of the night watching TV while I tried timing the few irregular contractions I had, but faded away. Once again I woke up to go to the bathroom at 3:30 AM and was unable to fall back asleep. This wasn't unusual, but then I started feeling contractions again at about 5:30 AM, which can be best described as menstrual like cramps (this description is mostly for women as men will know nothing about this kind of pain). Contractions started to become more regular lasting for about one minute with roughly a 10 minute break in between. Rest was now impossible to find. As much as I had heard that I should try to rest because "you won't get any later", I couldn't. Something I wanted to make sure of was that I was still getting enough protein and ate lunch. Another thing that I wanted to do if this was the real deal was to take a shower. Who knew when I'd be able to next? About 1:00PM I talked with Ginger on the phone and let her know what had been going on within the last 24 (or more) hours. I let her know what was happening with my contractions and from my description she derived that I was not yet in Active Labor since they changed with my activity. For instance, I always felt a contraction when I got up from bed. She said that she would be in my area later that day and if things drastically changed to give her a call. My contractions had become closer together and regular despite my changing positions. Again, though I tried to relax and rest, I simply couldn't sleep. I laid down and closed my eyes and despite my sleepiness, it never came. Back labor had already started and at some point that was how I knew a contraction was beginning. Starting in my back and then wrapping around to the front where I would start to feel the menstrual-like cramps. Ty had come back home and though I was worried about jumping the gun, having just experienced a nine minute period of several waves of contractions on top of each other, I decided we should call Ginger and give her an update. I had no desire to be on the phone so Ty did the calling for me while I went through another contraction. Ginger made the decision to come since things were obviously progressing right along and instructed Ty to start filling the birth tub with hot water. Oh my goodness! This was getting serious. :) I remember Ty asking me if I was hungry and wanted any dinner, but a meal didn't sound great and I decided against it. Looking back, I should have tried to nibble on some protein. Ginger had arrived! I was surprised at her energy considering she had two births in a row in the two days previous. When she got here she asked if I wanted a cervical check and I did. I was about 8 cm dilated! Um, holy cow. What this meant to me was that I definitely knew my body and could trust my instincts. Also, that in a short time, I would be holding my baby. After the exam, I stopped keeping track of my contractions since I didn't see the point. Now, I knew it was time to call my mom and let her know she needed to come. I called her cellphone...no answer. Gah! Of all the times to not answer your phone, this was not a good one. I called my parents house and my youngest brother answered and I asked where my parents were. My mom was babysitting my brother's kids while my sister-in-law came to Tri-cities to pick up my brother from the airport and my dad was at work. GAAAAHHH!! Would my mom be able to make it in time? Didn't they all know we were on Baby Watch 2012 here?! Next, I called my dad and he answered. Yes! He asked what I was doing and as nonchalantly as possible, while enduring another contraction, I said, "Oh nothin'. Just in labor and having a baby soon." Just as calm he said that he guessed that meant that they needed to head our way. My parents were able to leave my brother's kids with my grandma next door and were on their way. The tub had been filled, but the water was just a bit cold, though it still felt good to be in. Ty spent a good amount of time emptying out water while we let the water heat back up and let a pot of water boil downstairs. Once the hot water was put in and the temperature started to rise, it felt sooooo divine. Then, a contraction came and I would assume position to let someone put pressure on my low back. Being that I've had issues with my hips and alignment, I knew it was a strong possibility that I would have back labor, but that doesn't make it any less painful. At some point Ty asked me if I wanted to watch a movie and I was all for any kind of distraction. I decided on Get Smart and Ty set up the laptop so that I could watch it from the tub with everyone sitting around me. Mom and Dad had arrived! I was so glad to finally see my mommy. I knew neither one of us wanted her to miss this and I wanted her support. She laughed at us as she came in to see that we were watching a movie. :) If anything it was keeping my spirits up. Even though my dad had brought my mom, I didn't want him upstairs since I wasn't very modest at the time. However, one thing that was really important to me was that my dad would be there to assist Ty in giving me a Priesthood blessing. I put on my robe and sat on the yoga ball while my mom and Ginger held my hands and braced my legs in case a contraction came and I could have something to resist against. By now, I had started making noises to help me release tension during each contraction and was worried that I would ruin the spirit of it. However, I felt so calm during the blessing and knew that I had my Heavenly Father with me and that everything would be fine. I also had the love and support of family and my midwife and her assistant. Knowing this helped to carry me through each contraction. Though, I will fully admit that I understand the appeal of an epidural. I'm kind of guessing on time a little bit here because I'm having trouble remembering. After the blessing, I got back in the tub and I remember everyone finding things for me to snack on. First, it was an Otter Pops (Ty asked me what kind I wanted and I really could have cared less. Haha. I just wanted it cold. ), Applesauce (really glad I bought that the day before), and Vanilla Greek Yogurt for some protein. During the process of my labor, every so often, Ginger or Marcile (the birth assistant) would use the doppler to read and monitor the baby's heartbeat. She was doing so good. I can't remember when (I think between 10:30 and 11:00), but Ginger asked me if I would like another exam to see how I was doing. I said, yes and we moved to the bed. I had now progressed to 9.5 cm and was fully effaced. However, my water had yet to break and Ginger asked if I wanted her to try and do that. I gave my consent, but my cervix was still posterior and the sac was so tough she was unable to do so. So back in the lovely warm water I went. My contractions were increasingly more painful and the groans I had initially used had grown into yelling. I was also growing more exhausted. Remember, I had been awake since 3:30 AM with no sleep in between then and this point. Though I wanted so badly to rest and sleep, the contractions prohibited me from either. I remember saying that if I wasn't about to have a baby, I'd be getting the best sleep ever after such an intense workout. By now, through intermittent watching, the movie was over. I was still in the tub, now really letting loose through the contractions. I kept thinking my neighbors were going to call the police on us for domestic violence. We hadn't told them our birth plans after all. My midwife had finally made the brilliant decision to turn the light off in the room and letting the light from the other rooms give the little illumination we needed. It was as if it changed my entire labor. Suddenly, I felt like I could rest in between contractions. And then, finally, I felt that sensation to push, which is similar to feeling like you are having a bowel movement. I continued in the tub and during one of my breaks, Ty looked at his phone and showed me the time and announced that our baby would definitely be born on the 16th, the day before my birthday. This is quite funny considering anyone who talked to me about her due date knew that I didn't want her to be born on my birthday. It just figures that she wanted to be born the day before. :) Of course, I wasn't really laughing right then. After pushing for awhile, I could tell that something was keeping me from progressing. Not that anything was wrong, I just wasn't getting anywhere. Ginger suggested trying to push while on the toilet because then that pushing feeling is more natural. I figured it couldn't hurt and was worth a try, so I left the blissful warm water, though it had started getting cool, and headed into the bathroom. In case you are wondering, I forgot about keeping up my dignity and pride long before and wasn't too concerned with "what it looked like". Still, I must admit that because I was screaming my lungs out during each contraction I was still a little worried about what my neighbors would think of me. Not enough, to keep me from belting it out though. This position of pushing while on the toilet seat was definitely making a difference. I could feel my baby girl moving down into the birth canal. Ginger said that if I wanted I could reach down and feel the head, since she thought that my water had broken while I had been in the tub. I reached down and felt something, but it didn't feel like the head. I described it to Ginger and my water had in fact NOT broken. Once again, Ginger tried to break it and this time succeeded. Now we were back in business. I felt for her head again and then felt something quite different than before and knew it was her little head. Ginger asked if I wanted to deliver in the bathroom or if I wanted to go back to the tub and I really wasn't sure. In the end, I decided to stay in the bathroom since I couldn't imagine moving and so awkwardly. Pushing was really progressing and everyone (except Ty, who stood in front of me while I clutched his hands during the contractions for support) was getting things together in preparation. Suddenly, I felt the Ring of Fire, though I don't know that I would have called it a ring, but there was definite burning. Ginger came into our small, narrow bathroom and instructed me to get off of the toilet and go down to the ground on all fours and asked Ty if he wanted to catch the baby. He said sure, but I don't think he knew what he was getting himself into. :) I love hearing his perspective, so I'm going to let him share what he got to experience first. It's a difficult thing to see someone you love in pain and not be able to do anything about it. I did my best to stay by Jenny's side, to try to comfort her as best i could, and to meet her needs in any way possible. Mostly that meant applying pressure to her back during contractions and hauling boiling water up the stairs to keep the tub warm. When the tub got too full I would scoop the water into a mop bucket with a pot and then empty it in the tub. It was a long, slow process and my back and legs paid the price, but it felt good to be able to contribute in some way. Once we moved to the bathroom, I could tell things were getting close. I tried to stay close to Jenny to support her any way I could while still staying out of Ginger's way. Jenny would have preferred to return to the tub for the actual birth, but things were happening to fast and I think she just wanted to get it over so she delivered on the floor in the bathroom. There isn't a lot of room in there. Ginger and I were behind her while her mom and Marcile were in front. Now that things were really getting down to business, I was ready to just get out of the way and let Ginger do her thing. She had a different idea. While helping Jenny to get situated she asks me, quite casually like it was no big deal, if I wanted to catch the baby. I wasn't expecting this and didn't really understand what all that implied, but I said, "Sure". I could see Anna's head just starting to emerge. It didn't look like I expected, though Ginger had explained how it all worked. It was small and wrinkly and, it may sound insensitive, but I remember thinking that it didn't look human at all. As the head came out a little bit further, Ginger told me to put my hand under her head and to put a little pressure downward on the back. On the next push, her chin and mouth popped out. It was beautiful and a little unsettling at the same time. She still looked doll-like, not really alive. With the next push, her arm came out with the rest of her head. I was able to grab her by the body now and Ginger said to go ahead and pull her the rest of the way out. What had been a strange, foreign thing was now a beautiful, screaming baby girl. I was surprised at how strong she was as I held her there on the bathroom floor. I had been expecting a small, fragile baby but she was big! and strong! Then Ginger had me slide her forward to her mother, leaving me quite dazed and overwhelmed. It had been a long, stressful night, but it had been worth it! The burning was intense and was more so when I pushed. I had no desire to continue with that feeling, but knew that this baby was only coming out one way. Through the encouragement of my midwife, her birth assistant, my husband, and my mom I pushed past the pain and felt her little head emerge. The hardest part was over, at least that's what it felt like to me. With another push, the rest of her body seemed to just slide out. Anna (pronounced Aw-nah) Renee was born at 1:29AM on February the 16th of 2012. Immense relief overwhelmed me and I hung on my mom while I cried with joy that it was over and also at the sound of my baby's cry. Ty slid her underneath me and I picked up my brand new daughter and held her against me. I couldn't believe it. I had just given birth. She was beautiful and complete. Four years of waiting for this little person and she was finally here. The word "surreal" was used multiple times following her birth. Once I had her in my arms, it was time to move to the bed where an older sheet and a cover where put to protect it from getting anything on it. The chux pad that was underneath me during her birth was folded up and held by Ginger and Marcile and we somewhat awkwardly made our way to the bed. I continued to hold my little sweetheart while I delivered the placenta. At 1:35AM I was technically, now, considered not pregnant. Ty then cut the umbilical chord and the placenta was examined where all was found to be normal. During the delivery, I sustained a minor 2nd degree tear. Mostly it was just skin, but there was a small amount of muscle that tore. I also managed to have some swelling. Ginger numbed me and stitched me up. I believe that she said I had 11 stitches total. Four for the muscle and seven for the skin. After I was cleaned and stitched up, I was able to feed Anna. My dad had been downstairs the whole time, though I think he might have fallen asleep. I finished feeding her and my dad came upstairs and helped measure her and then she was weighed. She was 8lbs. 15oz. and 21.5 inches long. Her head circumference was 35cm. I knew she was a big baby! Dad got to hold her before he had to leave for home. Finally, everything was taken care of and cleaned up, I laid down with my baby Anna next to me and slept. FINALLY!